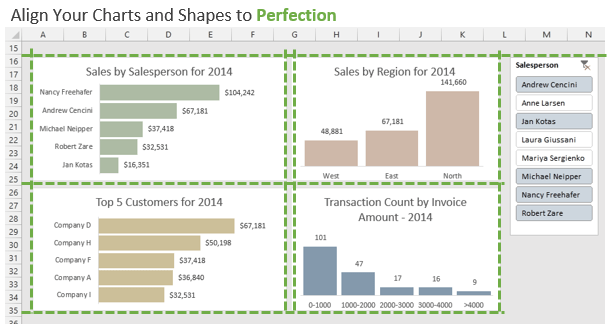 Bottom line: Learn a few quick tips for working with multiple charts and shapes in your Excel Dashboards. Select a chart by left-clicking the border with your mouse. Both charts will be selected and you can move, copy, align, or delete them. The Move+Ctrl method is a quick way to make a duplicate copy of a chart. Move the chart by dragging it with the mouse. Hold down the Ctrl key. An outline of the shape will appear. Note: You must move the chart first before pressing the Ctrl key. Release the left mouse button to make a copy. Ctrl+D is another shortcut that will make a duplicate copy of the chart. You will typically still have to select and move the new chart though. This is one of my favorites because it keeps your charts or shapes aligned to perfection. Hold down the Ctrl and Shift keys. An outline of the shape will appear. The new shape will stay aligned (either vertically or horizontally) with the original shape. This one is great because it saves a step of then having to align a chart after you make a copy. It's a great trick to use when creating panel charts or dashboards. Select multiple charts using the Ctrl keys. Select from the Align options on the Format tab of the ribbon. The Distribute buttons on the Align menu are also great for making the space between shapes equal. My friend Mynda Treacy from My Online Training Hub has a great webinar on how to create a dashboard in Excel. The webinar is going on right now and will only be available for a short time. Here is a video with a little more info. I also show a shortcut to copy and align your charts in the video. This is basically an hour long training session on how to create dashboards in Excel, and you will learn a ton. Click the link below to register for the free webinar. I was able to copy shapes in the excel sheet, but suddenly I am unable to do so. What “switched off”? Very useful because enhances productivity. I’m curious, what software do you use to make those beatiful screencasts with animations? Thank you Miguel! I use Camtasia to record my screencasts and videos. It’s an awesome tool! I really co’undlt ask for more from this article.